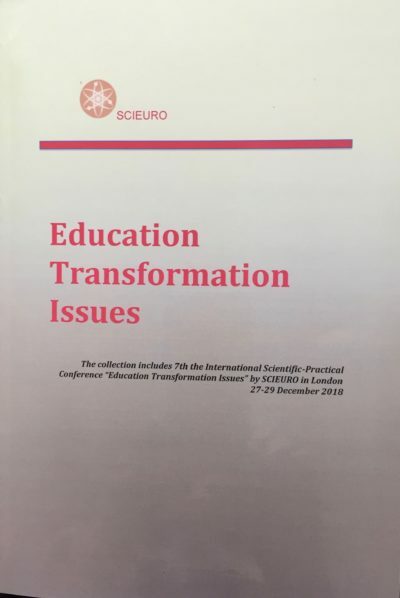 Печатный сборник 9th the International Scientific-Practical Conference “Education Transformation Issues” 27-29 December 2019 отправлен авторам 15 февраля 2019. Печатный сборник 10th International Conference “Science and Technology” 27-29 October 2018 отправлен авторам 22 декабря 2018. 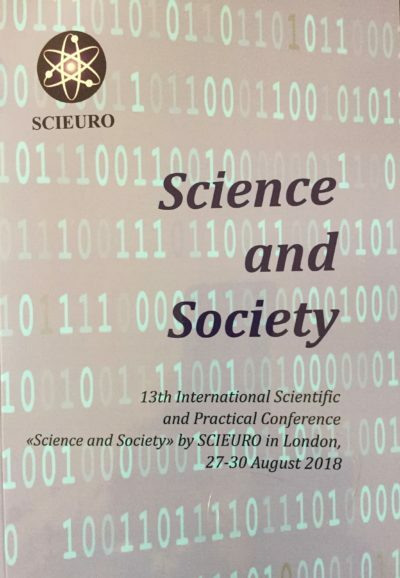 Печатный сборник 8th The International Conference “Social Science and Humanity” 27-29 September 2018 отправлен авторам 24 ноября 2018. Печатный сборник 13th International Scientific and Practical Conference “Science and Society” 27-30 August 2018 отправлен авторам 13 октября 2018. 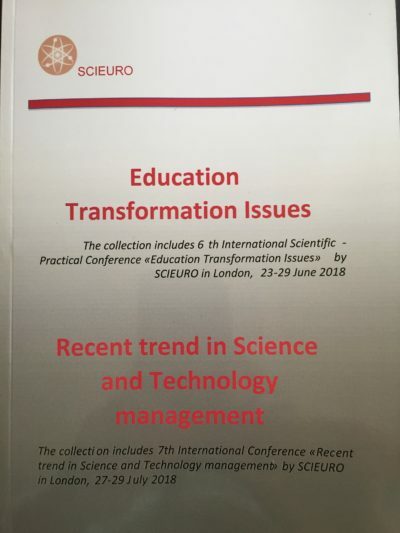 Печатный вариант сборника 6th the International Scientific-Practical Conference “Education Transformation Issues” 27-29 June 2018/7th International Conference “Recent trend in Science and Technology management” 27-29 July 2018 отправлен авторам 5 сентября 2018. 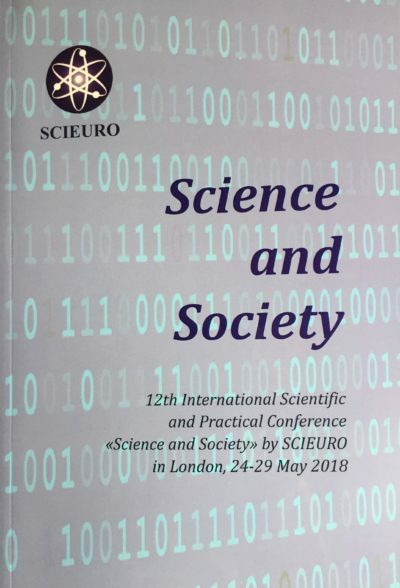 Печатный вариант сборника 12th International Scientific and Practical Conference «Science and Society» London, 24-29 May 2018 отправлен авторам 15 июля 2018. Βсе сборники конференций, согласно законодательству Великобритании, рассылаются в библиотеки Великобритании. Отчет Британской библиотеки (The British Library) о размещении сборника. Печатный вариант сборника 10th International Conference “Science and Technology” 23-29 April 2018 отправлен авторам 13 июня 2018. Печатный вариант сборника 8th The International Conference “Social Science and Humanity” 23-29 March 2018 отправлен авторам 12 мая 2018. 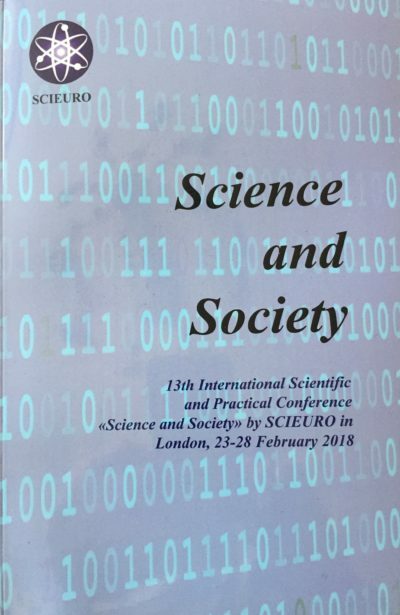 Печатный вариант сборника 13th International Scientific and Practical Conference «Science and Society» 23-28 February 2018 отправлен авторам 12 апреля 2018. The printed version of 13th International Scientific and Practical Conference «Science and Society» 23-28 February 2018 sent to the authors in April 12 2018. Печатный вариант сборника 9th International Conference “Recent trend in Science and Technology management” 23-29 January 2018 отправлен авторам 23 марта 2018. The printed version of 9th International Conference “Recent trend in Science and Technology management” 23-29 January 2018 sent to the authors in March 23 2018. Печатный вариант сборника 6th the International Scientific-Practical Conference “Education Transformation Issues” 23-29 December 2017 отправлен авторам 19 февраля 2018. 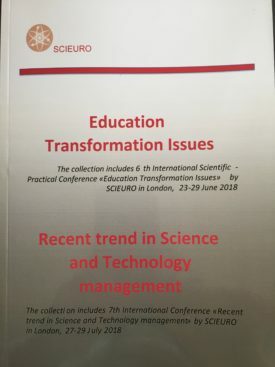 The printed version of 6th the International Scientific-Practical Conference “Education Transformation Issues” 23-29 December 2017 sent to the authors in February 19 2018. Печатный вариант сборника 12th International Scientific Conference «Science and Society» 24-29 November 2017 отправлен авторам 24 января 2018. The printed version of 12th International Scientific Conference «Science and Society» 24-29 November 2017 sent to the authors in January 24 2018. Печатный вариант журнала «Science and Technology» 23-29 October 2017 отправлен авторам 23 декабря. 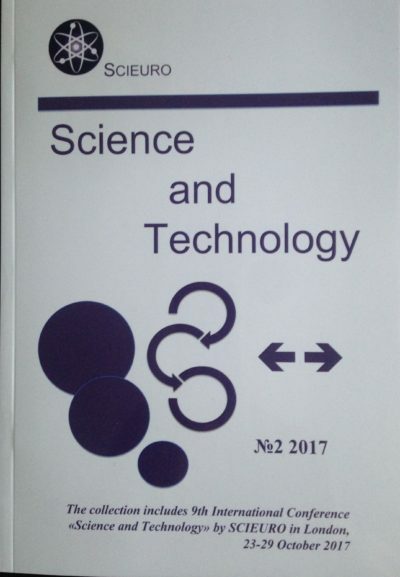 The printed version of Journal«Science and Technology» 23-29 October 2017 sent to the authors in Desember 23. Печатный вариант журнала «Science and Humanity» Сентябрь 2017 разослан авторам 18 ноября 2017. 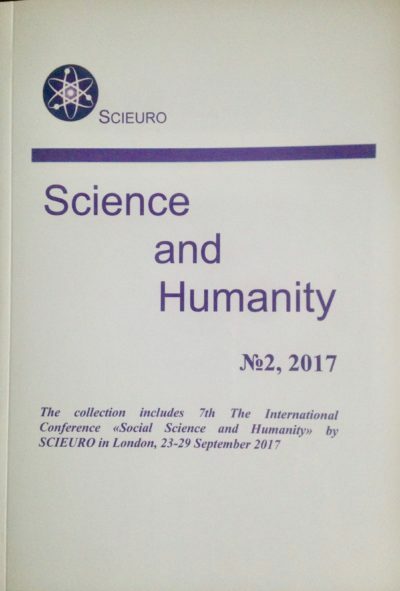 The printed version of Journal «Science and Humanity»September 2017 sent to the authors in November 18. 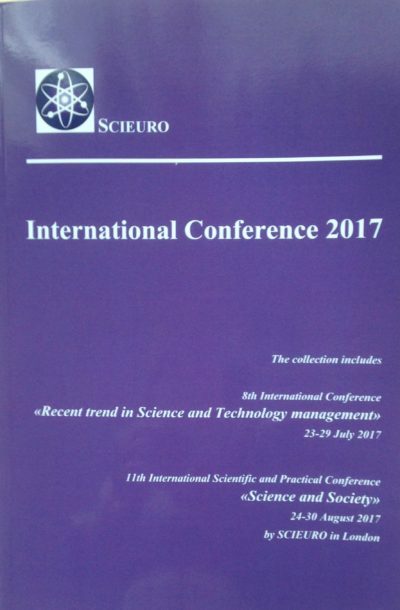 Печатный вариант журнала «Recent trend in Science and Technology management» Июль 2017 и «Science and Society» August 2017 разослан авторам 25 сентября 2017. The printed version of Journal»Recent trend in Science and Technology management» Июль 2017 и «Science and Society» August 2017 sent to the authors in September 25. Печатный вариант журнала «Education Transformation Issues» Июнь 2017 разослан авторам 17 августа 2017. 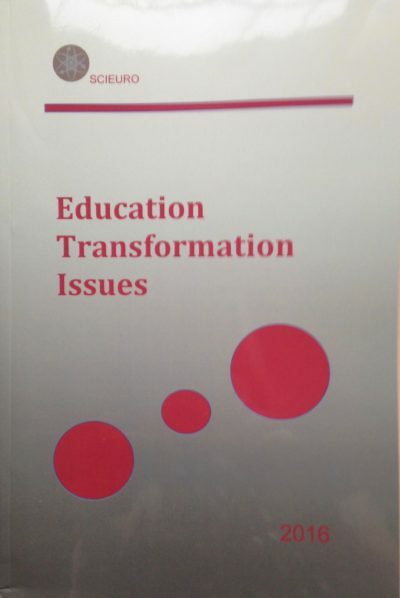 The printed version of Journal «Education Transformation Issues» June 2017 sent to the authors in August 17. 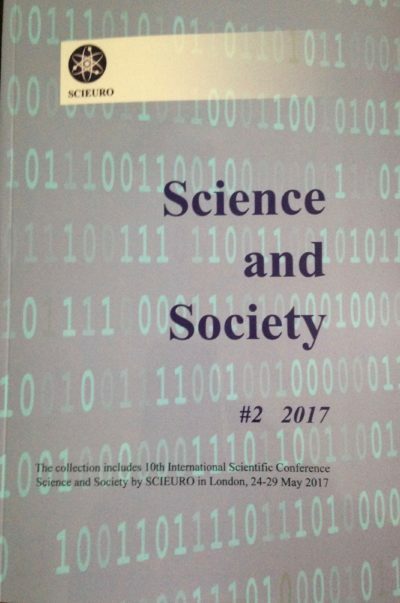 Печатный вариант журнала «Science and Society» May 2017 разослан авторам 17 июня 2017. The printed version of Journal «Science and Society» May 2017 sent to the authors in June 17. Печатный вариант журнала «Science and Technology» April 2017 разослан авторам 17 июня 2017. The printed version of Journal «Science and Technology» April 2017 sent to the authors in June 17. Печатный вариант журнала “Science and Humanity”, Март 2017 разослан авторам 16 мая 2017. 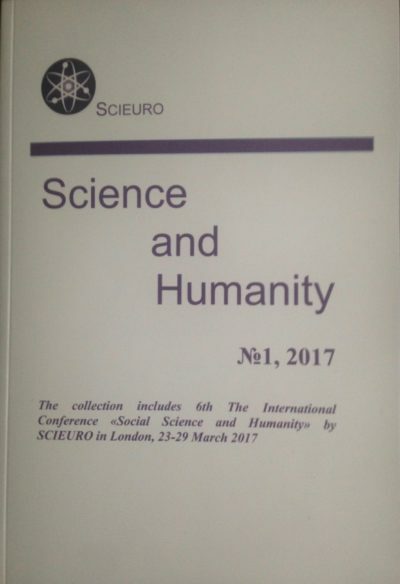 The printed version of Journal “Science and Humanity”March 2017 sent to the authors in March 2017. For each author of the journal an electronic certificate of the participant is provided without fail (in English). The magazine is published in the UK. Imprint of the UK. Applications for participation are accepted until May 29, 2017. Accepted articles see here. For the cost of publication, see Payment. Since March 2017, the cost of publication is 5000 rubles. For the preparation of the article, see Requirements for articles. The working language is English, Russian. Requirements for articles see here. The journal is multi-disciplinary. Articles are accepted for all specialties that are related to scientific publications and will be of interest to the scientific community. Applications and texts of articles are submitted electronically: mail@scieuro.com. Within 2-7 working days after receipt of the article, a decision is made to approve or reject the application for publication in the journal. Magazines and monographs on the interlibrary loan system will be available in 170 universities in the UK: COPAC, SANCAT, SCONUL, SALSER, CAIRNS, and the US Library of Congress, to which the British Library is connected. Thus, the materials of the magazines will be available around the world. Magazines with articles are placed in the largest international citation databases. 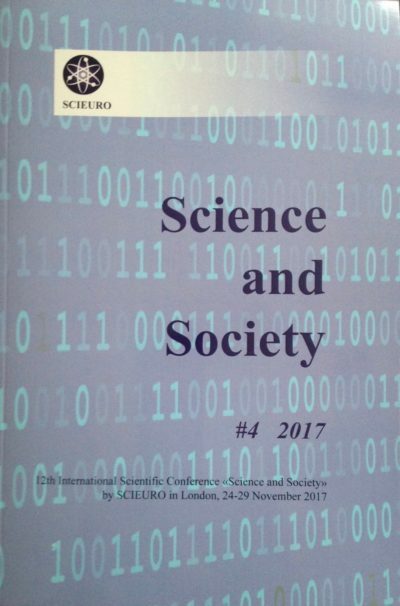 Печатный вариант журнала “Science and Society” №1, February 2017 разослан авторам 13 апреля 2017. 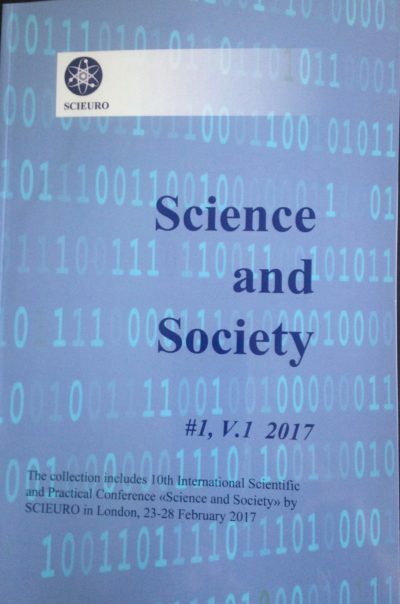 The printed version of Journal“Science and Society” №1, February 2017 sent to the authors in April 13. Печатный вариант журнала“Recent trend in Science and Technology management” январь 2017 разослан авторам 10 марта 2017. 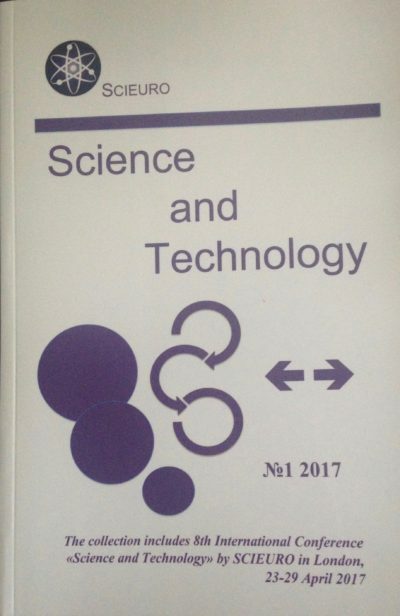 The printed version of Journal «Recent trend in Science and Technology management» January 2017 sent to the authors in March 20. 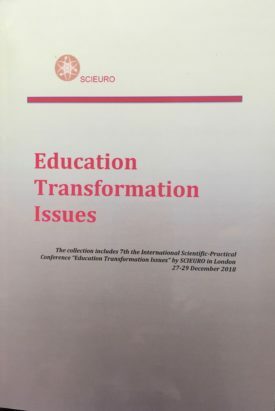 Печатный вариант журнала“Education Transformation Issues” декабрь 2016 разослан авторам 20 февраля 2017. 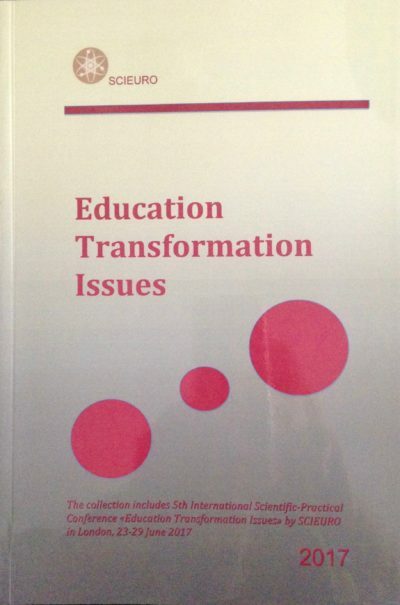 The printed version of Journal «Education Transformation Issues» (December) 2016 sent to the authors in February 20. Печатный вариант журнала“Science and Technology” #3 2016 разослан авторам 25 ноября. The printed version of Journal «Science and Technology» #3 2016 sent to the authors in Desember 17. Печатный вариант журнала“Science and Society” #3 2016 разослан авторам 1 февраля 2017. 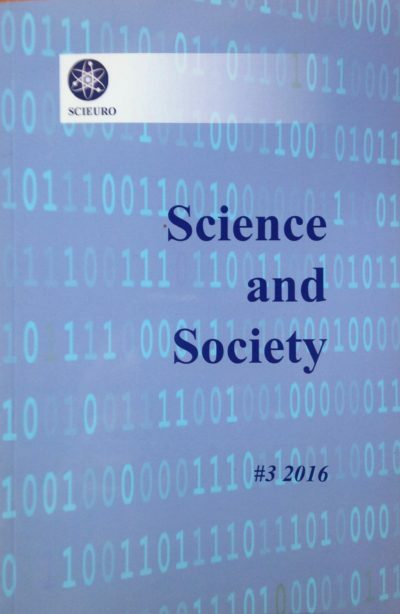 The printed version of Journal «Science and Society» #3 2016 sent to the authors in February 1. 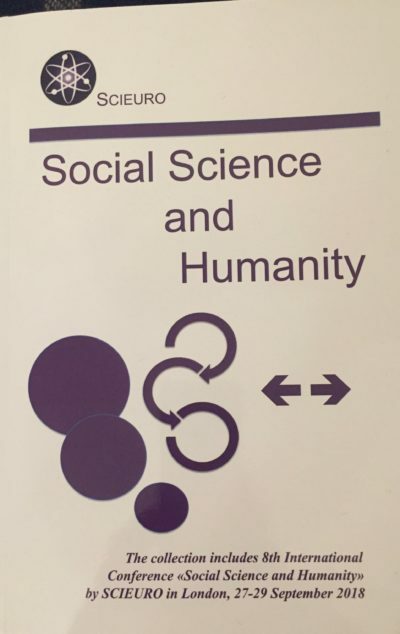 Печатный вариант журнала“Social Science and Humanity” #3 2016 разослан авторам 25 ноября. 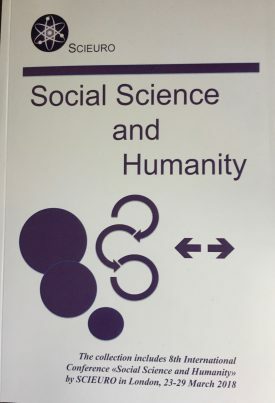 The printed version of Journal «Social Science and Humanity» #3 2016 sent to the authors in November 25. Печатный вариант журнала“Science and Society” #2 2016 разослан авторам 20 октября. The printed version of Journal «Science and Society» #2 2016 sent to the authors in October 20. 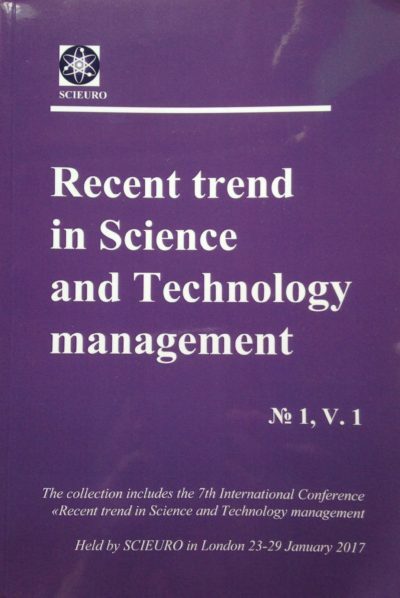 Печатный вариант журнала «Recent trend in Science and Technology management» #2 2016 разослан авторам 19 сентября. 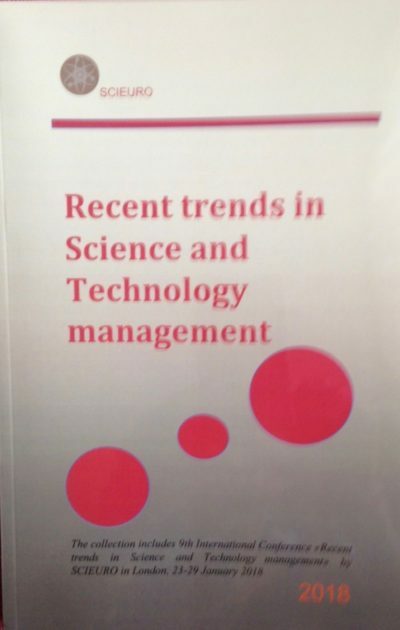 The printed version of Journal «Recent trend in Science and Technology management» #2 2016 sent to the authors in September 19. Печатный вариант журнала «Science and Technology» #2 2016 разослан авторам . 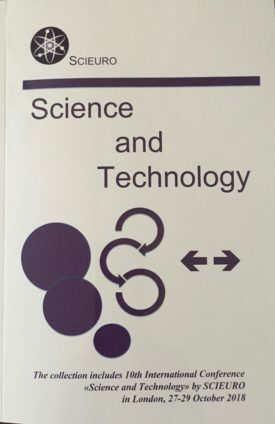 The printed version of Journal «Science and Technology» #2 2016 sent to the authors. Печатный вариант сборника разослан авторам . The printed version sent to the authors. Печатный вариант сборника разослан авторам 17 мая 2016 года. The printed version sent to the authors 17 May 2016. Печатный вариант сборника разослан авторам 18 апреля 2016 года. The printed version sent to the authors 18 April 2016. Печатный вариант сборника разослан авторам 17 марта 2016 года. The printed version sent to the authors 17 March 2016. Печатный вариант сборника разослан авторам 17 февраля 2016 года. The printed version sent to the authors 17 February 2016. Печатный вариант сборника разослан авторам 9 января 2016 года. 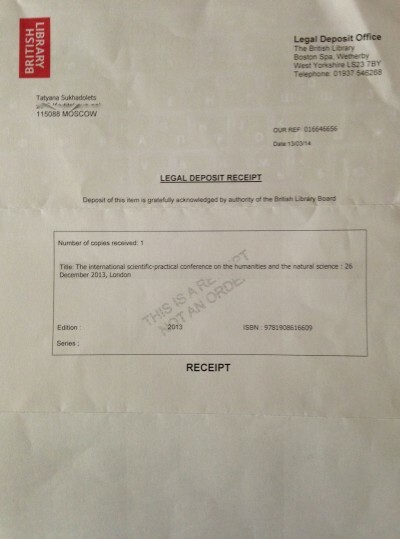 The printed version sent to the authors 9 January 2016. Печатный вариант сборника разослан авторам 11 декабря. The printed version sent to the authors 11 December. Печатный вариант сборника разослан 17 ноября. Печатный вариант сборника разослан 6 октября. Печатный вариант сборника разослан 7 августа. Печатный вариант разослан авторам 1 июля. Печатный экземпляр разослан авторам 18 апреля 2015. Printed copy sent to the authors April 18, 2015. Печатный экземпляр разослан авторам 14 марта 2015. Printed copy sent to the authors March 14, 2015. Печатный экземпляр разослан авторам 5 февраля 2015. 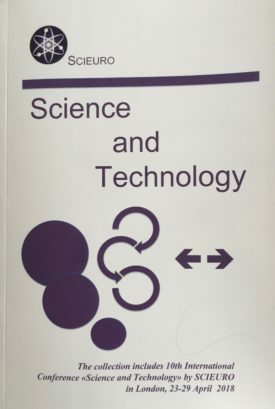 Printed copy sent to the authors Febrery 5, 2015. Печатный экземпляр разослан авторам. Printed copy sent to the authors. Печатный экземпляр разослан авторам 9 декабря 2014. Printed copy sent to the authors Desember 9, 2014. Печатный экземпляр разослан авторам 7 ноября 2014. Printed copy sent to the authors November 7, 2014. Сборник 4th International Conference on the political, technological, economic and social processes, 27-28 July 2014 разослан авторам 15 октября 2014. Collection of 4th International Conference on the political, technological, economic and social processes, 27-28 July 2014 sent October 15, 2014. Сборник «4th International Conference on Science and Technology». 17-18 June 2014» разослан авторам 19 сентября 2014. 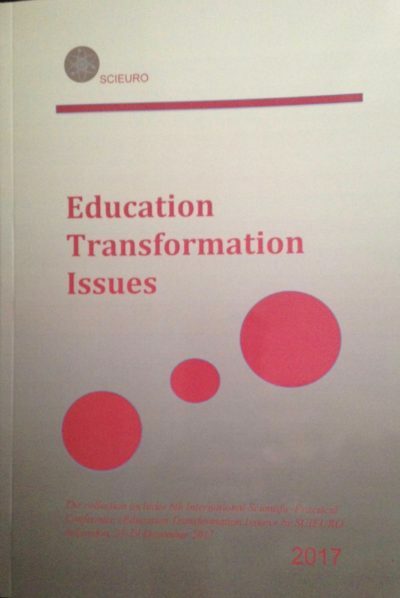 2nd the International Conference on the Transformation of Education 24-25 April 2014. Сборники конференции «Innovations in science, technology and the integration of knowledge» 27-28 February 2014 разосланы авторам 25 июня 2014. Сollection sent 22.10.13/Печатный экземпляр сборника отправлен авторам 22 октября 2013. Сollection sent /Печатный экземпляр сборника отправлен авторам. Bednarzhevskiy S.S., Zapivalov N.P., Smirnov G.I., Korol Zh.V. Bednarzhevskiy S.S., Zapivalov N.P., Smirnov G.I., Korol Zh.V. Collection sent 22.06.13/Печатный экземпляр сборника отправлен авторам 22 июня 2013. Collection sent 10.06.13/Печатный экземпляр сборника отправлен авторам 10 июля 2013. Pchelina O.V. RUSSIAN EMIGRATION: EXILE OR MISSION? Collection sent 02.08.13/Печатный экземпляр сборника разослан авторам 2 августа.